What happened? How did eucalyptus become flora non grata in California? The story is a spectacular rise, and equally spectacular fall, in three phases: introduction, naturalization, and deterioration. First came the era of mass introductions. For roughly half a century following the gold rush, California nurserymen imported eucalyptus seeds from Australia and grew them by the millions. Pioneer planters and state authorities promoted eucalyptus as a replacement for overharvested oaks and redwoods, as a producer of railroad ties, as a preserver of soil and climate, even as a remedy for malaria. 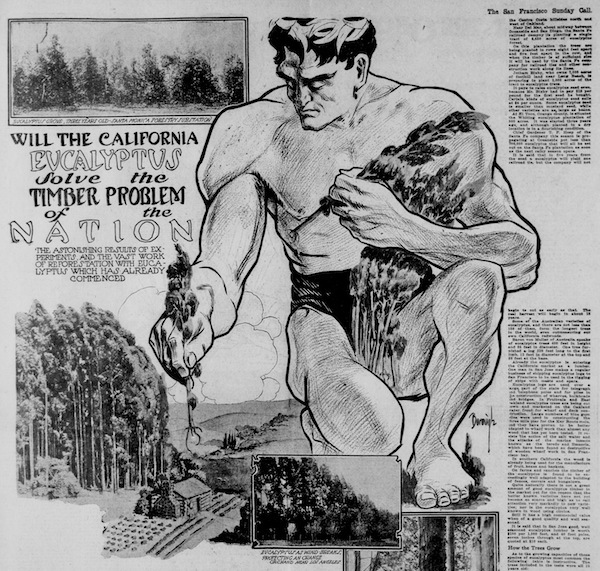 Plantings peaked during the “eucalyptus craze” of the 1870s and the “eucalyptus boom” of 1907 to 1913—the Golden State’s answer to Dutch tulipomania of the 17th century. Start-up timber companies hyped the “miracle tree” as the answer to a looming national “hardwood famine.” In fact, many of these companies were fronts for real estate flippers. The bubble collapsed in 1913 when a government study proved that young eucalyptus makes low-grade lumber. Timber companies immediately shut down, leaving small-time investors stuck with devalued property. In the aftermath, tens of thousands of acres of seedlings in coastal hills from Marin to Santa Barbara County were essentially left to go wild. The trees thrived in the fog belt: they naturalized in the biological sense. 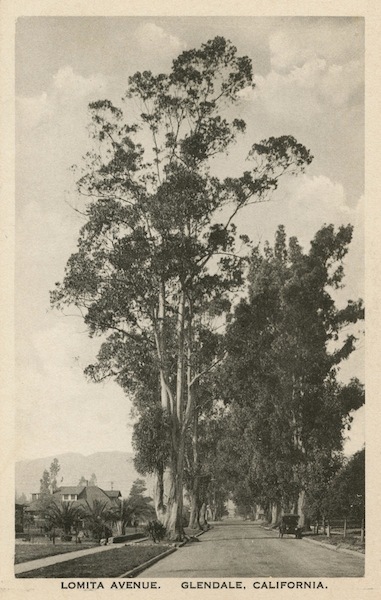 As of 1913, lowland California was still paradise for eucalyptus: a bioregion with favorable soil and climate but no Australasian diseases, insects, birds, or nibbling koalas. Protected by the wide Pacific from natural enemies, gum trees in the Golden State grew preternaturally fast and large—attaining sequoia-like size in 50 years, becoming some of the largest hardwoods on the planet. Eucalyptus also naturalized in the cultural sense: “California’s adopted tree” seemed at home. Even though eucs had repeatedly failed to meet the outsized hopes of promoters, they remained important as firewood, as orchard windbreaks, and as roadside ornamentals. As of the 1950s, one could drive nearly the entire length of the Golden State, from Shasta County to San Diego, without ever losing sight (or smell) of blue-green foliage. Gum trees from Australasia were far more prevalent than redwood, the official state tree, and scarcely less iconic. So how did Californians grow disenchanted with eucalyptus? And why did the most commonly cultivated species, Tasmanian blue gum, go from being a marker of belonging to a vexed symbol of nonnativeness? The explanation consists of several overlapping factors and one big disaster. Starting in the 1980s, land management agencies advocated—and often mandated—habitat restoration at certain publically owned nature preserves. Conservation biologists wanted to bring back aspects of California’s pre-settlement lowland landscape, which was marked by grasses more than by trees, and browns more than greens. In the Bay Area, leftover blue gum plantations from the boom years had become feral forests. Because these woodlands adjoined densely populated areas—and because postwar developers built neighborhoods within them—they grew into a fire hazard. The hazard became deadly during the Berkeley Hills firestorm of 1991, which took 25 lives and destroyed the homes of some 5,000 people. After the disaster, many residents disowned eucalypts and, borrowing from conservation biology, reclassified them as giant weeds and alien invaders. Strange scenes unfolded in the Bay Area. Euc-hating environmentalists fought tree-huggers and defenders of migrating monarch butterflies, which roost in coastal eucalypts. Habitat restorationists worked against landscape preservationists. Eucalyptophiles from the 1980s to the present have at times used inflammatory phrases like “veggie racism,” “botanical xenophobia,” and “biological nativism” to describe the motives of native plant advocates. Meanwhile, in Southern California, eucalypts proved all too mortal. They fell victim to development, age, drought, and beetles. In the ’80s and ’90s, a series of insect infestations—a consequence of container shipping and non-stop transpacific flights—caused widespread die-offs of old eucalypts in cities throughout the state. A series of well-publicized street tree accidents in the past few decades has added to the impression that eucs present an imminent public safety risk. Do gum trees in California deserve this evil reputation? The answer is a carefully qualified no. Every tree in the world will eventually undergo structural failure if something doesn’t kill it first. Trees of any kind can be eaten by beetles, weakened by fungus, stressed by drought, buffeted by wind. Eucalypts sometimes drop large branches out of the blue—a terrifying thing—but so do many native trees. Nonetheless, people interpret tree failure differently for different species. Hazard is a cultural and legal concept, not a botanical one. When a naturally occurring native oak collapses onto a bicyclist, it can be legally categorized as an act of God. When a nonnative eucalyptus—a “killer euc”—does the same thing, it can potentially be construed as a liable offense. The matter of biological invasion has been similarly overstated. Of almost 400 eucalyptus species introduced to California since the 1850s, fewer than 20 have naturalized—that is, become self-reproducing populations. And only one of these naturalized species, blue gum (E. globulus), has become a nuisance as a moderately invasive species. And only in the urban-wildland interface in one eco-zone, the coastal fog belt. And only after humans gave it a huge head start by establishing plantations. E. globulus cannot be considered a textbook invader, or even a noteworthy one. It’s not as if eucalyptus escaped and overran lowland California on its own like periwinkle, pampas grass, ice plant, tamarisk, English ivy, Scotch broom, French broom, Russian thistle, Himalayan blackberry, or any number of other true problem plants. Blue gums continue to serve as lightning rods in California for two main reasons—one about location, the other about symbolism. Old specimens tend to be found in highly visible locations near or within cities. They are associated with infrastructure problems such as disrupted sewers, buckled sidewalks, impeded power lines, littered yards, obstructed views, increased insurance rates, and exposed liabilities. The other reason for their infamy is almost too obvious: blue gums are distinctive-looking trees, and trees can function as symbols in a way that grasses and shrubs cannot. They can be easily individuated and anthropomorphized. They can be imagined as grandfathers, guardians, adopted children, dirty foreigners, shallow-rooted immigrants, naturalized citizens, or illegal aliens. We should stop using eucalyptus as a political symbol of bioinvasion in California. Instead we should see it as a historical symbol of desire. In the past, Californians desired and cultivated eucs because they grew quickly, tolerated a variety of growing conditions (including heat and drought), and, most of all, because their foliage, bloom, scent, and shade made the Golden State more beautiful. All of which is still true. Going forward, we need subtler terminology and politics to deal with the problem of plants out of place. We inhabit an eco-cosmopolitan world; globalization is here to stay. It matters less where plants came from originally than how they fit in now. From this point of view, eucalyptus belongs in some parts of California and not in others. Context means everything. In nature preserves like Channel Islands National Park and fire-prone neighborhoods like the Berkeley Hills, it makes perfect sense to eradicate eucs or thin their numbers. But in other places—for example, the edges of farms, highways, campuses, and large metropolitan parks—gum trees ought to be maintained as elements of the biocultural landscape. Here they should be tended and replanted as part of the Golden State’s heritage. But we don’t have to use the same species as 19th-century planters. Botanists and arborists can recommend species and varietals that are shorter, less messy, and more water-wise than blue gums. A wonderful poem, “Each Thing We Know Is Changed Because We Know It,” by the California writer Kevin Hearle begins: “A eucalyptus has its implications where I come from …” In California, gum trees imply that this bioregion was conquered with greenery. Even as American settlers felled redwoods and oaks with abandon, even as they drained and filled wetlands, they brought forth artificial forests, garden cities, and gainful orchards. They staged a revolution with trees. We are the caretakers of this horticultural legacy—the good, the bad, and the beautiful. Jared Farmer is the author of Trees in Paradise: A California History (Norton, 2013). 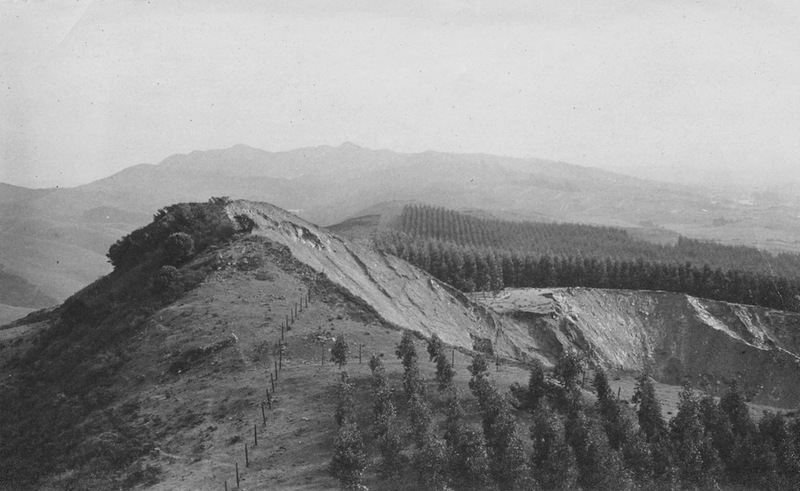 *Top photo of former eucalyptus plantation, Berkeley Hills, 1917, courtesy of Fritz-Metcalf Photograph Collection, UC Berkeley. Interior photos courtesy of Jared Farmer.